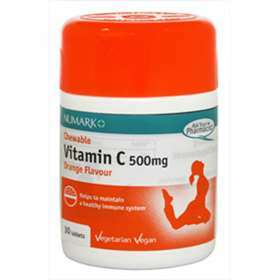 Numark Chewable, Orange Flavoured Vitamin C helps support the immune system by providing antioxidants to the body. Vitamin C is also useful in helping to form collagen, the 'glue' that binds cells together, helping to maintain tissue integrity and support a healthy circulatory system. Antioxidant - helps to fight cell damage by 'free radicals'. 30 tablets in a sealed plastic pot. For adults and children over 12 take 1 tablet daily with food. Vitamin C 500mg, Sucrose, Maltodextrin, Stearic Acid, Magnesium Stearate, Hydroxypropylmethylcellulose, Silicon dioxide, Maize Starch, Flavouring, Modified Maize Starch.